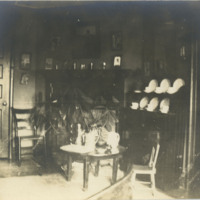 Interior view of an unidentified student's dorm room. The image depicts the furniture and decorations of the room. On the right side of the photograph, there are several dishes stacked on a shelf. 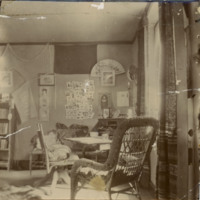 Interior view of a student's dorm room. The photograph is from the papers of Mary Helen MacCoy '00. 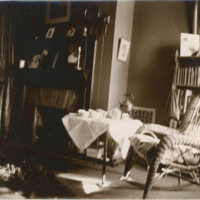 The image depicts several furniture and decorations in the room. There is a flag on the wall with "1900" written on it. There are several other posters/ photographs and a fan hanging on the wall. 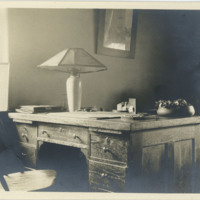 Interior view of a student's dorm room. The photograph is from the papers of Mary Helen MacCoy '00. The image depicts the furniture and decorations in the room. 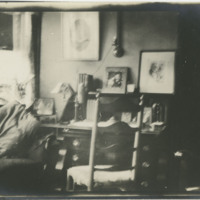 Interior view of a student's dorm room. The photograph is from the papers of Mary Helen MacCoy '00. 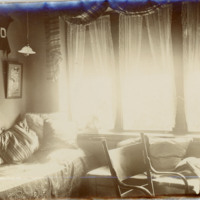 The image depicts the bed and several other furniture and decorations in the room. 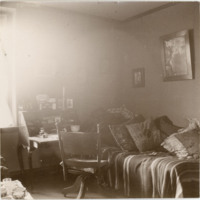 Interior view of Dorothy Foster's room (Room 42) in Pembroke East. 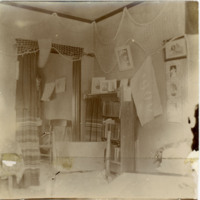 Foster wrote on the back "A Corner of my Room Taken by Mary -" The image depicts three curtained windows, furniture and two posters (one of Mona Lisa) on her wall. There is also a partially visible Harvard flag on the wall. 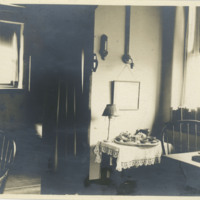 Interior view of an unidentified student's dorm room in Bryn Mawr College. The photograph is from the Adola Greely Album- 1904. 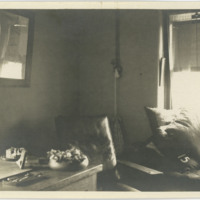 The image depicts a furnished corner of the room.